A top priority for the Baltimore City Department of Public Works is to safely and reliably deliver high quality drinking water to all customers. 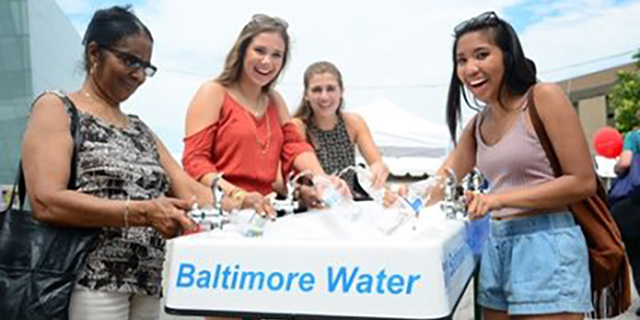 DPW provides safe drinking water to 1.8 million residential and business consumers, making the City of Baltimore the major water supplier for the Baltimore region. In addition to Baltimore City, DPW supplies water to the surrounding counties: Baltimore, Howard, Harford, Carroll and Anne Arundel. The Prettyboy, Loch Raven, and Liberty reservoirs house some 86 billion gallons of water. Baltimore has three water treatment plants, Montebello I, Montebello II, and the Ashburton Filtration Plant. Combined, the plants produce up to 360 million gallons of drinking water per day. The water filtration plants treat and produce water that meet or exceed federal and state drinking water standards. To report any concerns about your drinking water, call 311. Water customers outside of Baltimore City may dial 410-396-5352 for assistance. The Baltimore City Department of Public Works provides tours for our consumers, students, businesses, or anyone interested in the water filtration plants. For a tour at the Montebello Plant call 410-396-6040, and for a tour at the Ashburton Plant call 410-396-0150.